Antonio Ciccone was a promising young athlete and scholar, juggling multiple AP classes and varsity sports at Fox Lane High School, when tragedy struck in the spring of 2001, his senior year. During the first varsity lacrosse game of the season, Antonio was severely injured in a collision with another player. The injury fractured his 4th and 5th vertebrae and damaged his spinal cord, rendering Antonio paralyzed in all four limbs. He was diagnosed as a c4, c5 incomplete quadriplegic and was 18 years old. Confined to a wheelchair and dependent on others for his basic needs, Antonio has endured multiple misfortunes and setbacks in the years since, but remains incredibly optimistic and upbeat. As with many people who suffer from paralysis, Antonio’s medical, physical and occupational therapy needs greatly exceed insurance coverage and we are appealing to you for help. Antonio is currently completing his bachelor’s degree online at New School University and hopes to become a lawyer. He believes he will walk again and is eager to resume physical therapy in mid June, after a lengthy lapse. Family and friends of Tony Ciccone are raising money to pay for uninsured medical expenses associated with catastrophic injury. Tony has chosen to fundraise with HelpHOPELive in part because HelpHOPELive provides both tax-deductibility and fiscal accountability to contributors. Contributors can be sure that funds contributed will be used only to pay or reimburse medically-related expenses. For more information, please contact HelpHOPELive at 800-642-8399. Tony explains how transportation fits into his life. Now, without transportation, Tony is isolated at home. 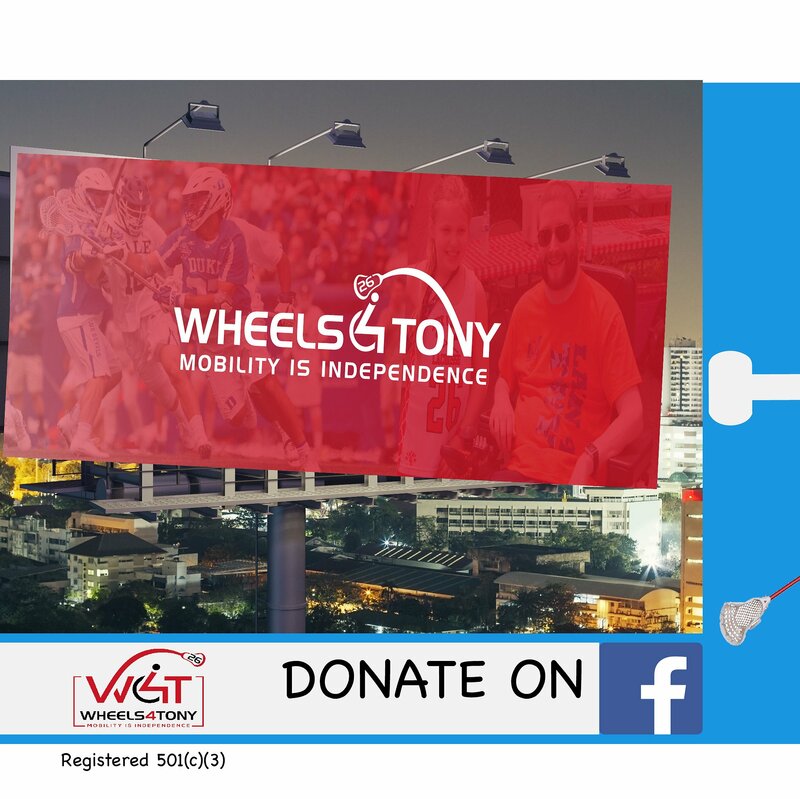 Wheels4Tony is a 501(c)(3) intended to return mobility to Tony’s life. Tony Ciccone and I have been working on a social media campaign to raise $60,000 for a conversion van to replace his 18-year vehicle that just died. Wheels4Tony underscores how important mobility is to Tony’s independence. He continues to fight for goals he believes in like finishing his undergraduate degree and pursuing a professional path, as his health allows. 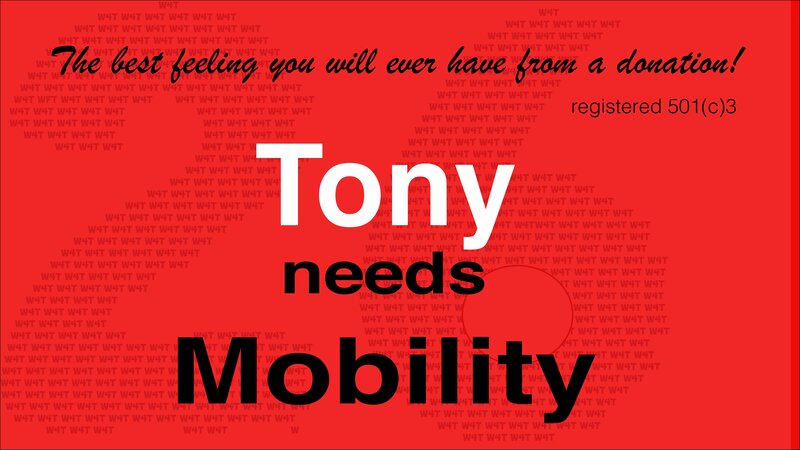 For Tony, no transportation means isolation which is extremely unhealthy. His friends and family participate gladly when he has transportation taking him in the van to social events. This is a registered 501(c) (3). Happy New Year! Once more I want to reach out to the HelpHopeLive and Laxin4Tony supporters to update you on my progress since my holiday greetings of 2012. I’m very happy to report that 2013 has been a great year, one in which I have made more progress than I have since my accident in 2001. First, thanks to the medical support the fund affords me, I have had no major health challenges in the entire year, no further post op complications from the neck surgery of Summer 2012, no hospitalizations, no major infections. My medical needs are well managed and it shows. In fact, I have lost 70 pounds, restored my blood pressure to normal levels and have completed two intensive rehabilitation therapies at the Burke Rehabilitation Hospital as of last summer. If you look at the link and photos below you will see me standing upright on a standing frame designed to develop muscle strength, improve bone density and reacclimate my body and nerves to an upright position and using a specialized bicycle which uses electrical impulses to assist my legs in moving the pedals. I have never had access to this level of rehabilitation before. It is not clear which technology will prove to be the most beneficial but the current plan is to get home based versions of these apparatuses where they can be utilized every day. The ongoing objective is to create as much independence as possible; my personal goal, however long it takes, is to one day walk again. Further, without the burden of health constraints I have resumed my studies at the New School online college and am maintaining a 3.8 GPA there. I hope to graduate with my Bachelors in 2015. Any thoughts or leads anyone might have about opportunities in all aspects of computers and programming are more than welcome! I am determined to translate my existing and anticipated expertise into marketable skills. All in all, this has been the best, most productive year of my life since 2001. Although it may be a cliché in other situations, in my case, I could NOT have done it without you, the HHL/Laxin4Tony community. My heartfelt gratitude to all of you. Words still cannot express what your help means, and has accomplished, for me. 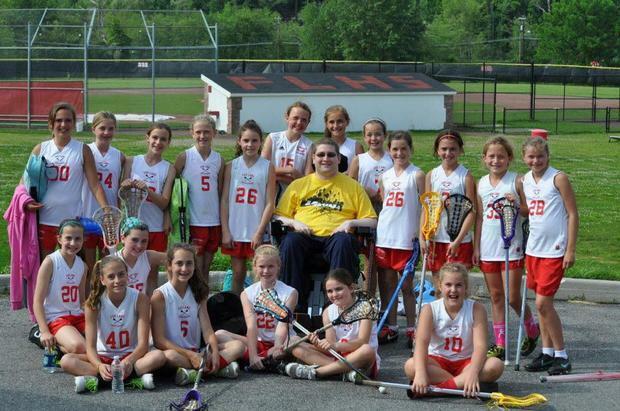 I attended this year's (2018) LAXIN4Tony girls lacrosse tournament at Fox Lane High School. 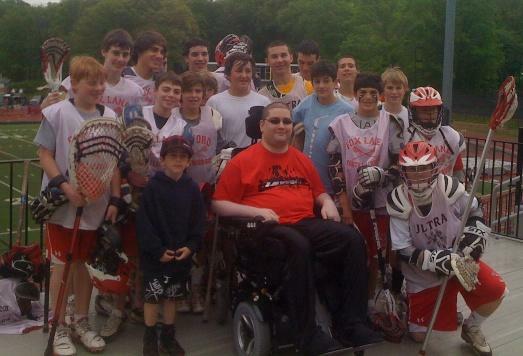 Got to see Tony taking pictures with young lacrosse players and others who have followed the annual event for years. 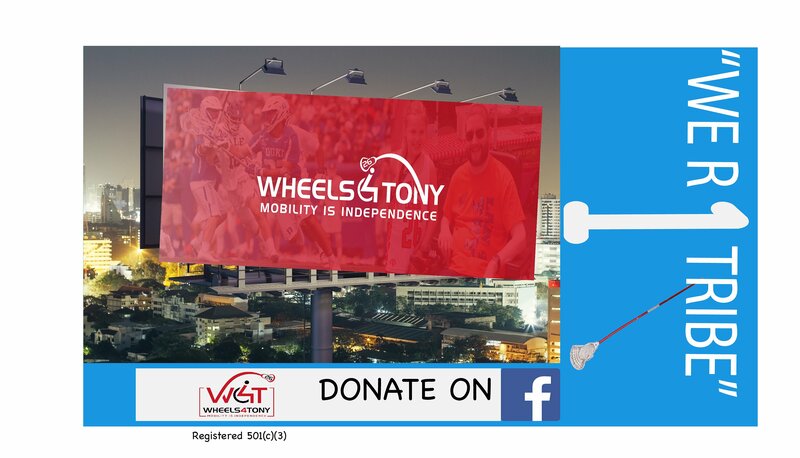 Looking forward to contributing to the Wheels4Tony campaign so Tony can get a vehicle needed to take him to and from work (new job) and college. May God continue to bless you, Tony. Best, Liz L.
Best of luck today on LAXIN for TONY ! Although Tony Ciccone was dealt an impossible hand in his senior year in high school, he and his very special mother (Linda) have remained strong. Linda is his main caregiver and is so caring and supportive of everyone. Let's see how much we can help them with donations. Tony-I enjoyed our visit last week. You have a great family and FLYL and the greater Bedford Community is behind you 100%.